WINNIPEG – If this was a Winnipeg Jets hockey game we would be going into overtime as FebruaryMLS® sales were identical to last year’s. We will have to wait until February 2013 to break the tie. On the other hand, dollar volume was a different story altogether with the clear edge going to February 2012 with dollar volume up 12% at $191 million. As a result, the average residential-detached sales price was notably higher at $266,000 in comparison to $240,000 in February 2011. Condominium average sales price also vaulted past February 2011 with a jump from $198,000 to close to $211,000 in February 2012. Another virtual tie came in newMLS® listings with 1,315 entered in February 2012 compared to 1,313 in February 2011. Even the total sales price to total list price ratio which is an indicator of strong buyer demand when the ratio climbs over 100% were nearly the same between the two February’s with ratios over 101%. As for other February’s, only February 2007 had 16 more sales than 2011 and 2012. One of the clear differences in February 2012 from last year is while there were only a few more over $500,000 residential-detached sales there were only half as many under $99,999 sales and for the first time ever the $250,000 to $299,999 price range had the highest percentage of total sales. In 2011 the lower price range of $200,000 to $249,999 always came out on top. FebruaryMLS® sales were even with last February at 781 while dollar volume rose 12% ($191.0 million/$171.1 million) in comparison to the same month last year. Year-to-dateMLS® units sales are only two shy of last year at 1,345 while dollar volume is up 10% ($324.3 million/$295.6 million) in comparison to the same period in 2011. Housing inventory remains tight with about a month and a half worth of supply if no new listings were to come on the market. While this is not the case in allMLS® areas throughout the Greater Winnipeg market region, there clearly is a need for fresh listings overall. So if an owner is thinking of putting their property on the market, they should be calling their REALTOR® to give them a current market assessment of their unique situation and positioning in the market as it may well indeed be a wonderful opportunity to give their listing full maximum exposure on theMLS® when there are less properties to compete against. 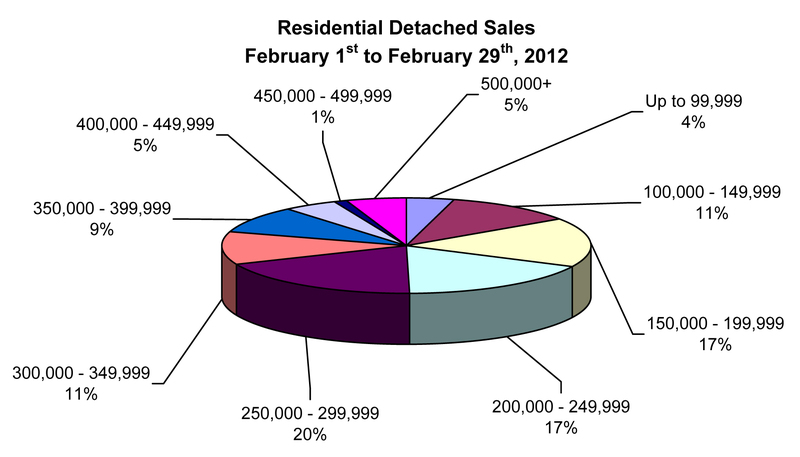 The most active residential-detached price range in February was $250,000 to $299,999 with 20% of total sales. The two next lower price ranges of $200,000 to $249,999 and $150,000 to $199,999 each grabbed 17% of total sales. While not quite as dominant as it has been, the price range of $150,000 to $199,999 represented 36% of the total condominium sales. The next busiest price range was from $200,000 to $249,999 with 20% of total sales. The average days on market to sell a home was 28 days, two weeks quicker than last month and 2 days slower than February 2011. Days on market for condominium sales was 28 days too, one week faster than last month and 4 days off the pace set in February 2011.